The Jump Force character roster promises to be a wild and varied bunch, though you could probably guess that from the teaser trailer, which showcased the colliding worlds of Dragon Ball, Naruto, and One Piece. You might also have guessed from that teaser that we’d see a few Death Note characters jump into the action – but it seems that’s not the case. 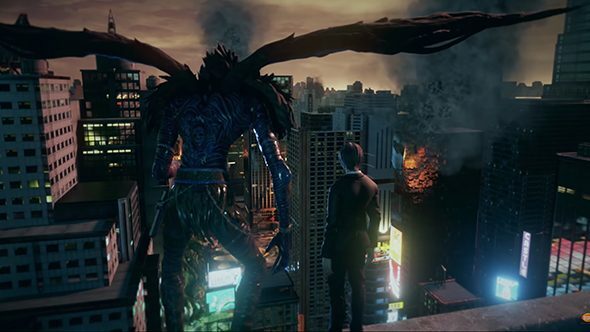 Light Yagami and Ryuk both made a brief appearance at the end of the first trailer, and we got a more detailed look at them in a new teaser you can see below. But apparently this is all for flavour, as the Death Note characters are meant for the game’s story – they’re not playable. Never go full anime before checking out all your options for the best multiplayer games on PC. Bandai Namco PR manager Nick O’Leary confirmed the news to Comic Book this week, mentioning Light’s unusual powers would make him ill-suited to a fighter. After all, you can’t really have a brawler where one dude just writes in a notebook, and having somebody like Frieza kick the bucket over a heart attack might be a bit anticlimactic. In the actual gameplay footage Bandai Namco has shown, we do have six confirmed characters. Goku and Frieza hit the battlefield from Dragon Ball, along with Luffy and Zoro from One Piece, plus Sasuke and Naruto from, er, Naruto. The 3v3 brawler is built in Unreal Engine 4 and will hit PC along with consoles some time next year.